the levee in Cedar Falls, IA, June 10, 2008. Postal employees whose property was damaged or destroyed due to recent flooding in Iowa and other parts of the Midwest are eligible to apply for grants from the Postal Employees Relief Fund, APWU President William Burrus has reminded union members. PERF provides financial assistance to postal employees and retirees who have suffered substantial losses as a result of natural disasters or home fires if they are not reimbursed by insurance or other grants. Supported and administered by the unions and the Postal Service, PERF is a tax-exempt charitable organization that is funded through donations from postal employees. 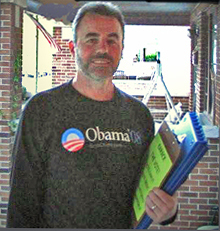 APWU member John Windle has been hard at work, boosting Sen. Barack Obama’s presidential campaign as the important May 6 Indiana primary approaches. Noting that his state has never been so crucial to a modern nomination battle, the Indianapolis Area Local member said, “I just didn’t want to let this opportunity pass without trying to amplify my voice." 04/16/2008 - The APWU has given a one-of-a-kind gift to the people of McCausland, Iowa: a donation of $30,000 to help save their post office. The contribution will pay for renovations to a building the small town purchased in order to stave off threats by the USPS to discontinue regular postal service for its 300 residents. The saga began more than four years ago, when the Postal Service closed McCausland’s only post office because of mold contamination. A “temporary” post office has never been up to code, and the USPS threatened in January of this year to close it on April 25. 01/09/2008 - APWU President William Burrus has asked the union’s state and local presidents to encourage APWU members to write to their U.S. representatives and ask them to co-sponsor and support the Mail Network Protection Act (H.R. 4236). The bill, introduced by Rep. Stephen Lynch (D-MA) on Nov. 15, 2007, would require the Postal Service to bargain with postal unions before it engages in significant subcontracting. Seven U.S. Representatives have signed on as co-sponsors. They are: Yvette Clark (D-NY), Al Green (D-TX), Raul Grijalva (D-AZ), Patrick Murphy (D-PA), Laura Richardson (D-CA), Christopher Smith (R-NJ), and John Tierney (D-MA). 10/15/2007 - An APWU advertising campaign in southern Michigan got underway last week, urging the citizens of Flint and Detroit to speak out against the consolidation of mail-processing operations into a new facility in Pontiac. The campaign is designed to generate interest in community meetings Oct. 22 and 23, when the USPS will discuss Area Mail Processing studies for the two cities. “The radio and TV ads will alert citizens to the danger of deteriorated mail service,” said APWU President William Burrus. “The USPS plans have been developed without any input from the American people. They are the result of efforts by big mailers to reduce their own postage costs at the expense of all others.” The Flint and Detroit consolidation studies are among nine ongoing nationwide. 07/27/2007 - Secretary-Treasurer Terry Stapleton has certified six union members as candidates for the position of Clerk Craft National Business Agent (A) for the Chicago region. 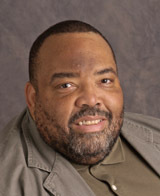 The nominating process was extended because of the untimely death of Percy Harrison Jr., who passed away on June 18. Brother Harrison had filed the necessary petitions for candidacy and was unopposed. 07/20/2007 - The APWU has been notified that a proposed consolidation that would have resulted in a mail-processing shift from one Wisconsin P&DF to another approximately 50 miles away will not occur. “After review, it has been determined that there are currently no significant opportunities to improve efficiency and/or service through consolidation of certain mail processing operations at the Oshkosh P&DF,” the Postal Service wrote to the APWU on July 18. 05/22/2007 - The APWU has been notified that the consolidation of some mail-processing operations at the La Crosse (WI) P&DF into the Rochester (MN) P&DF will not occur.